The Islam Awareness Blog: Did my children die because I married my cousin? "The doctors in York were trying to do 100% to keep her alive, I did have that hope but I could see she was in pain. She was sedated until she passed away. I had her in my arms for most of the time, then I lay down beside her. My husband realised she was taking her last breaths." Ruba says she has no idea how they have all endured the pain of losing three children and of suffering six miscarriages, the last just weeks after Inara's death. "I didn't even know I was pregnant at that time and I miscarried after the funeral," she says. She says it was Inara's death that made her accept a link between her children's misfortunes and cousin marriage. For a long time she just did not believe it, in part because she saw other ill and disabled children at the hospice and it was clear that not all of them were conceived by married cousins. Some were from the white community. "My husband still doesn't believe it," she says. "I believe it now because it's happened three times, so there must be something in what they're saying. It must be true." After Inara's death, some of Ruba and Saqib's relatives, both in the UK and in Pakistan, came to the conclusion that they were unlikely to have a healthy child - and argued that the marriage should therefore end in a "happy separation". This would allow both partners to remarry and have healthy children with someone else. "We both said no," Ruba says. "My husband says: 'If God is going to give me kids, then he can give me them from you. He's given me kids from you and he can give me healthy kids from you. If it's written, it's written for you. I'm not going to get married again and neither can you get married again, we are both going to try together.'" And although Ruba was reluctant to marry in 2007, after 10 years of married life she doesn't want to part. "Relatives wanted us to be happily separated for the kids, so that I can have healthy kids with someone else and so could he. But what if I do have healthy kids with someone, they might not make me feel like he makes me feel? I might have kids but not a happy marriage. It might not be successful marriage, and I don't want to bring kids up as a single parent. I have heard about people doing this but it's not for us." But what options does this leave them? The couple's experiences have led others in the family, including Ruba's brother, to reject cousin marriage. "We never use to think about the risks - up to my children we've never thought it was wrong to marry in the family, but because I've been through it my other relatives do think twice about going in the family," Ruba says. "Ten years ago I just accepted what my parents said, but now our cousins have been given a choice and they're saying no to that. Our younger generation have been given a choice and if they don't like it they can speak up about it." As well as losing three children, Ruba has also suffered six miscarriages, the last just weeks after Inara's death. She hadn't realised she was pregnant at the time, but miscarried after the funeral, when Inara was buried alongside her brother and sister. She is sustained by her religion and supported by her parents. "God only burdens a person with how much they can take. 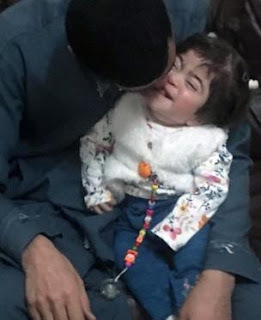 Sometimes I think people are so lucky, they don't have to try hard and they get a healthy child, but sometimes those children bring trouble when grow up and so those tests placed on them are different," Ruba says. "In this life I'm the unluckiest person, but in the next life I will be the luckiest because they were innocent children. And those children help you in the next life, because you will be with them."